Native flowers or wildflowers occupy a special place in our gardens. They are naturally suited to conditions of soil and climate that we find ourselves in, whether too dry, too wet, too shady for many other garden flowers. Wildflowers have ample nectar and pollen to support pollinators that share the same ecosystem. Invite birds, butterflies and hummingbirds into your garden by growing these beautiful native flowers. "Discovered by Nutall on the alluvial soil at the Arkansas and Red rivers, two or three feet high, with large purplish-pink flowers in August," The Flower Garden, 1851. The bud is encased in luminous, pale golden bracts, which resemble woven baskets. The 5" wide feathery flower heads are spectacular and make excellent dried flowers and are irresistible to bees, both native and honeybees. A just plain wonderful native annual flower with large (4”) fluffy flowers that tickle your nose as you bend to inhale the sweet honey-like scent. Named for the straw colored bracts encasing the buds that are as intricately patterned as the etchings on Acoma pottery. Its branching habit produces many white flowers with cream centers in succession throughout midsummer and fall. A lovely cut flower too. Fertile, well-drained, alkaline soils best, with low water needs once established. Once called Oswego tea, as the Oswego tribe was drinking fragrant teas of this herb when early botanist Bartram encountered the tribe. A flavor combination of citrus and mint, very refreshing. This selection is the best of the red bee balms, with early and large flower crowns of glowing crimson. June to August bloom. This top-rated cultivar sailed past the competition in mildew resistance - a top consideration when growing bee balms. Massive flower power to; all around a very nice new selection. Tall and bushy, it flowers for weeks in summer and grows to a 4' circle in 3 years for a hummingbird, butterfly and bee garden party. Plant in masses for loads of morning-fragrant golden yellow blooms atop curvy gray-green foliage. Deliciously scented of cocoa. 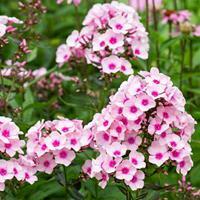 A summer blooming perennial in most areas, it blooms year-round in frost free zone 10. Native to Texas, it was first collected by botanist and doctor Jean-Louis Berlandier in the early 1800s. For regular, well-drained dry to average moisture soils, prefers neutral to alkaline pH soils. An arresting golden curved-petaled coneflower that leaves overbred, less hardy wannabes in the dust. 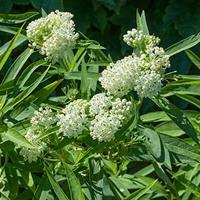 This rare native of Arkansas and Missouri thrives in well-drained soils in sun, ideal as a butterfly magnet and bird magnet too, as it has lots of nutritious seeds, free for the taking. 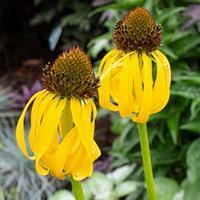 A native coneflower for dry gardens that blooms earlier than most, extending the summer season of these pollinator-friendly plants. Water until fully established when its tap root ensures drought tolerance. 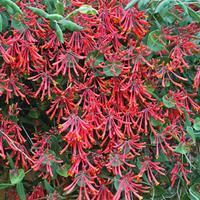 A fantastic new cultivar of the native twining trumpet honeysuckle, absolutely covered in clusters of red trumpet-shaped blooms in spring and early summer. Hummingbirds, bees and butterflies all find it irresistible, and the handsome red fruit that forms later in the season is relished by birds. As it blooms primarily on the previous years growth, prune to shape after flowering. Noninvasive and mildew free. This modern long-blooming hybrid is a great choice for regular garden beds and rain gardens both. A sturdy branching habit displays opulent spires of deepest pink in summer to fall, adding just the right vertical note to gardens. Native to eastern areas, it was named by Linnaeus, who had heard of its use by Native Americans to cure venereal disease. While false, the name stuck. Used medicinally for colds and stomach troubles by Native people and colonists alike. The flowers cover the stout stems with bloom for over a month in late summer. Rich, moist soils. Poisonous. 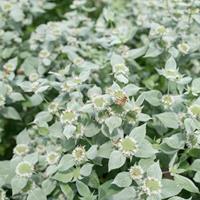 Attracts a wide array of beneficial insects, one of the best choices for bumblebees. A flounced skirt of chestnut petals edged in gold gather round the flower disk—a beaded column of sage green, studded with gold. Grey green cut foliage becomes a shimmering presence under the sun. Easy to grow in regular to dry soils, it naturalizes to create large drifts. Common milkweed's thick fleshy leaves provide plenty of nourishment for the caterpillar stage of the Monarch butterfly, whose yearly migration to Mexico for winter is near collapse, partly due to habitat loss. Fragrant flowers are thick and waxy and sweetly scented. They thrive in wet, yet freely drained soils, such as by ditches, and will spread by rhizomes. Easy to grow as well. Self sows. Cousin to the eastern common milkweed, showy milkweed is native to areas west of the Mississippi, with its range extending into Michigan and Ohio in the East. 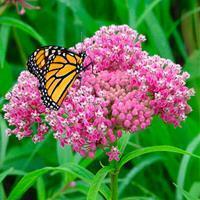 It is an important species for Monarch butterflies, the caterpillars feast on its leaves and the adult butterflies draw from the rich nectar sources of the pink to purple starry flower umbels. A wonderful and important addition to less cultivated sunny areas, adaptable to dry meadows and rain gardens alike. Moderate spreader by rhizomes. The round, flat flower heads of this deep pink, native flower are deliciously scented of vanilla. Their smooth, lance-shaped leaves turn glorious colors in fall and their gracefully shaped golden seedpods are a crafter's dream, and are filled with silky seeds that catch the breeze and paraglide away! March and April ship dates may ship as dormant plants. The round, flat flower heads of this deep pink, native flower are deliciously scented of vanilla. Their smooth, lance-shaped leaves turn glorious colors in fall and their gracefully shaped golden seedpods are a crafter's dream, and are filled with silky seeds that catch the breeze and paraglide away! The pure white 'Milkmaid' has rounded umbels of fragrant flowers that bloom in summer. The nectar-rich flowers provide food for butterflies, especially the Monarch that proceeds to lay eggs on this and other milkweeds. Good in heavy wet soils at the edge of ponds, it also does well in rich garden soil. Seeds float away in fall on silky parachutes. March and April ship dates may ship as dormant plants. The pure white 'Milkmaid' has rounded umbels of fragrant flowers that bloom in summer. The nectar-rich flowers provide food for butterflies, especially the Monarch that proceeds to lay eggs on this and other milkweeds. Good in heavy wet soils at the edge of ponds, it also does well in rich garden soil. 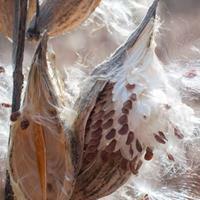 Seeds float away in fall on silky parachutes. A cloud of dense green leaves dusted with powdered sugar, or so it seems, for this spearmint scented mint family member has a multitude of silvery-white bracts surrounding the tiny clustered pink flowers. Easily grown in rich, regular to moist, well-drained soils; it spreads to make pleasing clumps, but is not invasive. The advent of summer in New England is always accompanied by the sweet scent of garden phlox in bloom. Heirloom 'Bright Eyes' is a lovely true pink with a ring of rich rose at the center of each floret. One of the best flowers to attract butterflies and hummingbirds too! Mildew resistant; provide organic, moist, yet well-drained soils. Deadhead after bloom.